I did something a little bit like that. I printed out ten slips of paper with various claims from the second half of Aristotle’s Metaphysics IV. 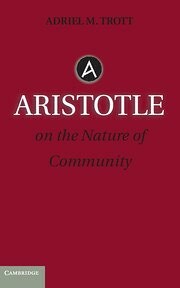 These were claims that Aristotle uses as examples to say either that the person was violating the ban on contradiction or was invoking it even if they claimed to deny the need for such a ban. For example, the first one was, say something that is meaningful to you and to someone else. Aristotle says to do this and thus to differentiate oneself from a plant is to invoke the law of non-contradiction. Another one said, to avoid tripping in the well, an action that implies that you are stating that tripping in the well is bad, not not-bad. I divided students into groups and asked them to explain how the claim on their paper either violated the ban or invoked it. We started the exercise on Wednesday when they had only read the first several chapters of IV where Aristotle sets up the need for the starting-point of theoretical knowledge and then articulates it. Then students had to read the rest of the book where Aristotle says he can’t demonstrate the truth of the claim but he can refute anyone who denies it. Students then had to reference the reading to explain how their claim would violate or invoke the ban on contradiction. Look, understanding Aristotle’s arguments about the law of non-contradiction is hard. I was leading a text seminar at the Collegium Phaenomenologicum this summer where I spent time talking about this with graduate students and we collectively struggled through the argument (ok, some of us — not me — thought it was self-evident in a this-doesn’t-even-need-an-argument way). So I know I am asking a lot of my students to work through this argument. But I think it is important, one, because it is good practice to think through logical claims about why Aristotle thinks all thinking depends on denying contradiction and two, because it sets up Aristotle’s view that knowledge is of what is and so we cannot say or know things that are not and cannot be. One thing I was struck by this morning is how much students got talking to one another. They had a lot to say and I had to stop them before the din in the room dropped off. Another thing was that doing this work helped them see what their questions were. After discussing, each group was asked to explain. I had made Canvas Pages slides that I put in a Canvas Module in advance with each claim, a short summary of Aristotle’s argument about that point, and the reference in the text. Afterward a student came up to me and asked if this was like the principle of explosion that he learned about in logic. I’m not a logician and I tend to resist thinking through named theories, so I told the student the truth–I didn’t know what that was. He explained it to me, including using symbols from his logic class, and I said, yes that sounds like exactly what Aristotle is concerned with. I told him Aristotle would take it further–not just that everything follows, but really that if everything follows, nothing follows. So it also worked to get students to connect the work they are doing now to what they learned in previous courses. I think it worked in part because the task wasn’t to answer some questions about Aristotle but to take some claim and explain how the Aristotle reading would explain the implications of the claim. I think I have a couple more ideas like this up my sleeve to get students to work to develop their categories for judging and thinking through the concepts they already have, and to see the reading as a resource for a problem they have to explain. I want them to experience the work of thinking, the difficulty and satisfaction of figuring things out, and the wonder that prompts the philosophizing. Thanks for this – it’s always good to see teaching posts in Philosophy!